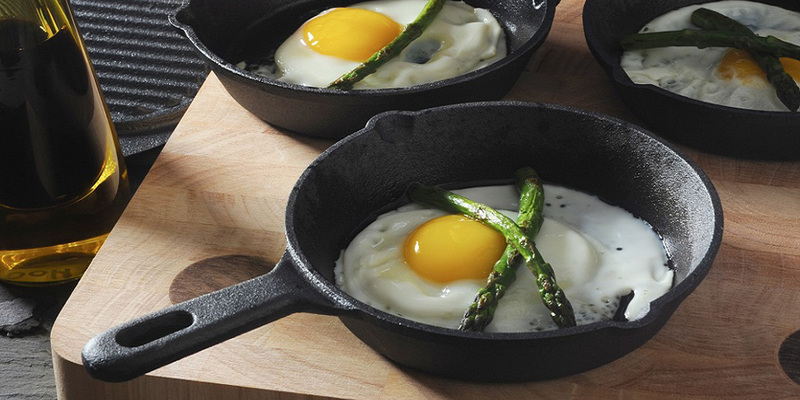 Follow our handy hints for many years of naturally non-stick cast iron cooking. Hand wash after each use and dry immediately with a clean soft towel. After each wash apply a light coat of vegetable oil to protect from moisture and to keep it seasoned and ready for its next use. Depending on the size of your cast iron use more or little oil, just enough to restore sheen with out being too greasy. The process of seasoning is when the vegetable oil is baked onto the iron at a high temperature. Seasoning your cast iron with vegetable oil means that it becomes naturally non-stick. Benefits of Using a Seasoned Product. The more you cook with a seasoned cast iron, the better your food will taste and the easier it will be to use as the layers form a natural non-stick surface. You can create and maintain the seasoning and even re-season if necessary meaning that your cookware will usually outlive cookware that has chemical non-stick coatings. We recommend hand washing after each use with warm water. You don’t have to use soap to clean your cast iron but if you have a stubborn bit of food that won’t come off you can wash with mild soapy water. Did you know: Cookware reaches a temperature of 400ºF / 200ºC in 4 minutes on medium heat and is sterile at 212ºF / 100ºC, so cleaning with soap isn’t necessary. We do not recommend cleaning cast iron in a dishwasher, using strong detergents or metal scouring pads as they remove seasoning. My cast iron has started to rust do I need to buy a new one? No need to buy a new one! Simply scour off the rust, rinse, dry thoroughly and then coat with a thin layer of vegetable oil. Rust occurs when the protective seasoning has worn off which is why we recommend applying a light coat of oil after each wash.
Food has started to stick to the surface of my cast iron, what can I do? Maintaining the seasoning by applying a light coat of oil after each wash should help to stop this from happening but if it does start to stick or the iron starts to look grey or dull, simply re-season your cast iron. Follow the steps below. Wash your cast iron with hot soapy water and a stiff brush. Rub in a small amount of vegetable oil covering the whole of the cast iron. Don’t use too much or it will be too greasy. Cover the bottom rack of your oven with aluminium foil (not directly on the bottom). Place the cookware upside down on the top rack of the oven to prevent pooling. Bake the cookware for at least one hour. After an hour turn off the oven and leave the cast iron to cool in the oven. Store it uncovered in a dry place.